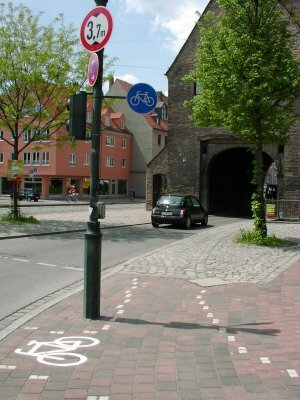 In Germany bicycle lanes have to be used by law, if there is an official sign. The term “Radweg” means “bicycle lane”, but it can also be understood as “Rad weg!”, which means “bicycle keep away” – just have a look at the following pictures and you may understand why and why many everyday cyclists do not really want to use those “Rad weg!” lanes :-(. 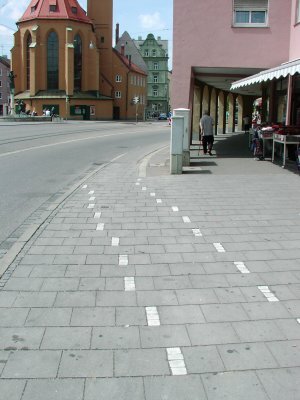 Augsburg has also some “nice” examples for “safe bicycle lanes”. This section is on my former daily commute to my work place and I stricly use the roadway (or I drag the bicycle on the pavement, if I buy something at the kiosk, which is within Jakober Tor as well). The beginning of the compulsory(!) bicycle lane. The lane passes the single track passage at the right side on cobblestone(!). Very secure during winter :-(. The passage at a closer view. The lane does not only look narrow – it is that narrow! Behind the passage it’s continued between parking cars at the left and pedestrians on the right. And here the same from the other side. The markers of the (compulsory!) bicycle lane on the cobblestone are barely visible. 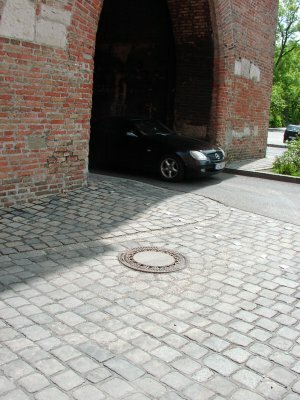 From the right side (when leaving the passage, this means more from the lower left side on the picture) there comes another road where the cars usually stop at the front border on the cobblestone and the drivers don’t expect bicycles from the left. And here the lane ends as “safe” as it started. You are directed back to the traffic directly on front of a traffic light. Not every car driver expects cyclists from the right. Meanwhile the way had been extended and now passes the Jakober Kirche and up the Leonhardsberg. 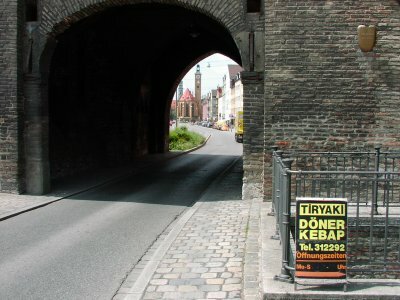 However, as with the section between Jakober Tor and Jakober Kirche, it uses half of the pavement in many sections – what practically leads to the situation, that pedestrians and cyclists often get in the way of each other :-(.